The first book in a new trilogy! 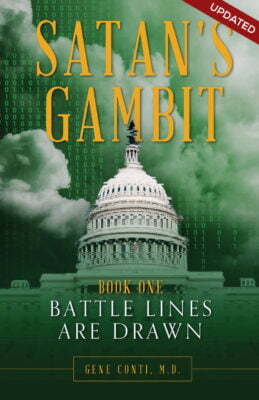 Book One in Gene Conti’s Satan’s Gambit Trilogy. UPDATED. The subtle truths of the Book of Revelation are unfolding in our time. For a better understanding of how this relates to today’s world, read Gene Conti’s first book of his trilogy – Satan’s Gambit. This veracious novel is full of action, intrigue, and solid evidence for a created and controlled world. Addressing the questions of “How did we get to this degraded state of our country and its citizenry….What led to this loss of morals and values….Why did we give up so much control?” – Satan’s Gambit Book One, The Battle Lines Are Drawn – lands the reader in a college classroom with a dozen or so students while they journey down the path of discovery during their elected fall course titled The Matrix Exposed 101. The reader is pulled quickly through, chapter by chapter, as the students are challenged to think and evaluate events that have led up to the current headlines of their time.